In NYC there are food establishments I call mega-delis. These monstrosities serve everything you’d expect: sandwiches, soups and salads, but also a few things you wouldn’t: sushi, pizza, udon, smoothies, mongolian BBQ, etc. Unfortunately more effort seems to be spent on managing how to get people in and out as fast as possible instead of making great grub. They make Mickey Dee’s look like slow food. Well, right near work, we have a mega-deli that also has a small Korean counter in the back. It’s always mobbed with people waiting, so I decided to give it a shot. I went for #2: “Spicy Chiken” (sic) and in 30 seconds a steaming container was shoved at me with a little kimchi for good measure. When I got back to my desk, I cracked it open and gave it a taste. Wow, this stuff was great! Like, sell drugs to pay for Spicy Chiken great. While I’ll only admit to eating it 3 times that week, it may have been more. Dominating the dish was a really distinctive taste that I couldn’t place, a super-umami flavor and a slightly gritty, but not unpleasant mouthfeel. It wasn’t really all that “spicy”, the mega-deli legal team must have forced a disclaimer. The only downside is that occasionally the chiken was swimming in a puddle of grease. Since it wasn’t consistently greasy (greazy? ), it must be related to where in the big pile they scooped from. Just like my old friend and obsession street meat, I needed to learn to make this. There was no Korean name listed for this dish, just “Spicy Chiken“. How do I find that? Where do I start? Wouldn’t it have been really great if the googster said “Did you mean Spicy Chiken?” when I looked it up with the proper spelling? In either case, I think I found the missing link. 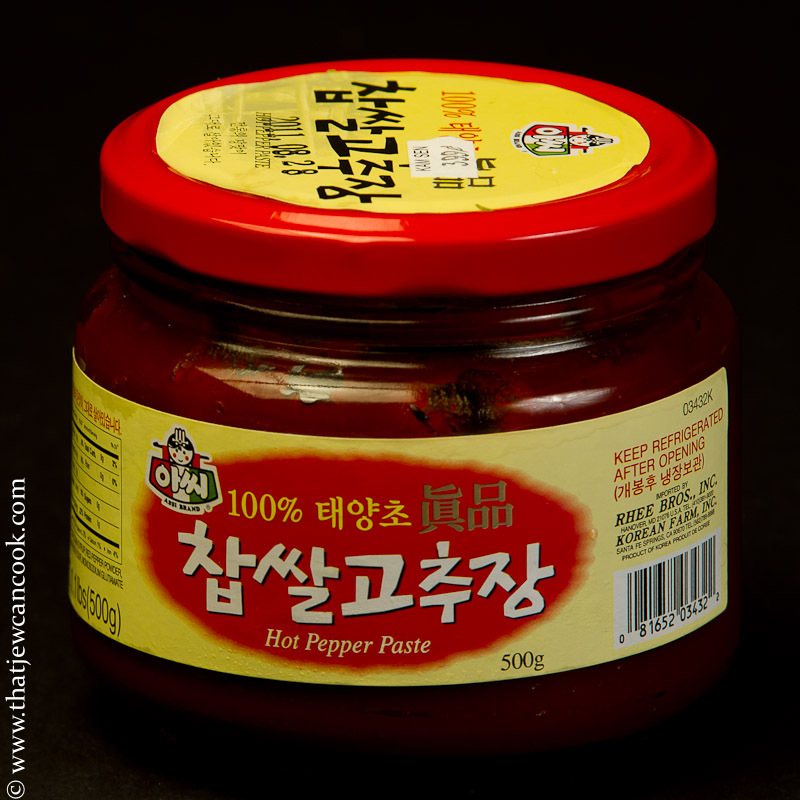 Repeatedly, a fermented pepper paste called gochujang kept cropping up. I checked my local Korean fruit and vegetable stand, and they had no idea what I was talking about. Most likely they know what it is, it’s seemingly in every recipe like some kind of Korean ketchup. If only I could pronounce it correctly. Finally, when checking a local asian grocery store, Nicole and I located the elusive sauce in the refrigerated section. At least I think we found it, the label is all in Korean but the letters and jar shape match the picture in wikipedia. The closest way I could describe the taste would be a blend of miso paste and roasted red peppers. If I ever do get to name a sports team, it will have to be “The Chujangs”, because I walk around the kitchen chanting as if its my favorite sports team: goooo —- chujangs! No wonder Nicole thinks I am nuts. 6 shiitake mushrooms, stems removed and sliced. You don’t have to use this kind of mushroom, but hey, shiitake happens. 2-3 teaspoons sesame seeds. I use a mix of white and black ones, just ’cause it looks cooler. 1 tablespoon mirin (sweetened sake). If you don’t have mirin you could probably fake it out with 1 tablespoon of rice wine vinegar and a teaspoon of sugar. Make the white rice in your favorite manner. I like my new 5 minutes in a pressure cooker trick. Use a little non-stick spray, and crank up the heat in a large pan. If you don’t care about calories a little peanut oil would be better. Stir it around really quick and remove from heat. The gochujang should thicken up the remaining liquid a bit. PS: If you know how to pronounce gochujang can you clue me in? This looks gorgeous and sounds a heck of a lot healthier than some of those oil-soaked dishes you get in restaurants. I’ll be trying this one. Thanks @KitchenWitch. Let me know how it comes out! That spicy chicken looks really tasty! This recipe looks so good, I will try it. Dorrie — Aha! I have been pronouncing it incorrectly, but it doesn’t seem far enough off for someone to not know what it is. Maybe they weren’t truly Korean! Cheers to you and Nicole! You guys sniffed out the secret Korean ingredient. It’s great to discover new dishes and then attempt to recreate it. I would love this too. Thanks for sharing it. THIS looks deadly and I love how you work at it until you develop the flavours. That is so much fun,and so valuable to me – as I know that this is a recipe I can then make, and count on to be tasty…. and I will do that. YUMMMM. Ran across your website on tastespotting – I’m Korean and my fiance is not. He LOVES the gochujang and will even dip his pretzels in it for a snack. (I think that’s just plain ol’ crazy.) But if you like your spicy chicken a little sweeter (some people do) you can add either sugar or corn syrup to it. I also add roasted sesame oil or garlic. Funny — I’ve started doing the same thing. Gochujang has become a regular for breakfast on an egg sandwich for me…I’ll try adding a little sugar, that sounds interesting! 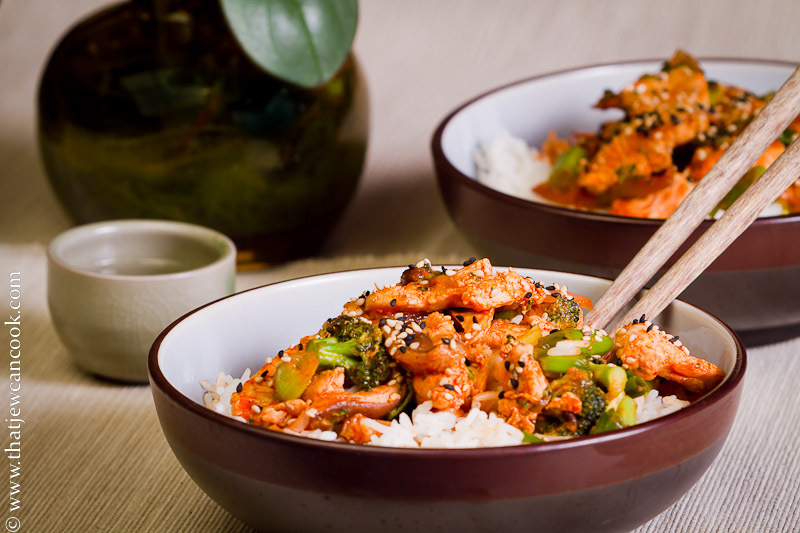 Whenever I see any recipes about Korean, I go crazy not only because I’m Korean but because wonderful deep flavor of Korean dishes. I am so glad that you choose the big secret of the Korean flavor, Go-Choo-Jang and right ingredient, chicken. It’s ssssoooo good and yummy! Next time you can try same recipes with pork, which is called Pork Bulgogi.It is also awesome! Amy, thanks for stopping by I will definitely have to try it with pork next time. I am really glad that my improvisation wound up being close to how someone Korean would actually make it! Hope to see you around. Morning Andy, I’ll take this and some bulgogi for breakfast, thanks. I loves me some Asian food but even though there are a ton of Koreans living in Sydney, I did not eat it as much as other Asian cuisine. Years ago, I lived down the street from a small Korean cafe in Chicago and would go there for their fabulous soup with bulgogi for breakfast! I will copy this recipe and try it and also look for this paste at the Asian grocery store next time I go! Looks divine!!! When I get bulgogi, I ask for it spicy and they mix in a little gochujang. Great stuff. BTW, I still haven’t made your piri-piri chicken sammich recipe, but its on my short list. Did you get any really interesting recipes while down under? Sorry but this recipe didn’t work for me. No garlic? Cooking chicken plain? If you are using store bought Gochujang it may work better, but home cooked stuff needs to be blended and diluted first.